At the June 28, 2016 Public Workshop #7, the RDU Airport’s land use plan was unveiled. This plan slates several forested areas for commercial development. This development would result in the destruction of irreplaceable, centrally-located forested recreation areas and in the destruction of an important green buffer space between the airport facilities and the very popular Umstead State Park. Ultimately, the destruction of this forested area could negatively affect the hundreds of acres within the Crabtree Creek watershed. We have created a petition to call attention to this and to let our local government (Wake County) and RDU Airport know that thousands of citizens in the Triangle and in North Carolina want to preserve these forested areas. Please sign our petition and bring your voice to the table! June 12-14th, Selene Yeager visited the Raleigh area. Selene was invited by TLC for Bikes and North Carolina Bicycle Club to check out the Raleigh bicycle scene. Fit Chick – Selene Yeager is an ultra endurance mountain biker as well as tri-athlete, an author on subjects such as bicycle racing, health and fitness, nutrition, strength as well as a writer for ‘Bicycling’ magazine. During her visit, Triangle Off-Road Cyclists was invited to speak about the mountain bike scene, NC Greenway Alliance was invited to speak about our greenway systems and Oaks and Spokes was invited to speak about our urban ride venues. Selene got in some quality road, mountain and greenway rides with all of us. TORC President, David Houskeeper and TORC Activities Director Valeries Myers, along with a few other TORC members, got the distinct pleasure of giving Selene a tour of Lake Crabtree County Park trails as well as some of the ORC area. Despite the heat and the humidity, we had a great ride on some great trails. Like most avid mountain bikers, we quickly fell into the familiar mode of simply enjoying the trails while enjoying good conversation. Twenty-one miles later and 1100′ feet under our wheels, we were tired and Selene was adequately warmed up for her, later in the day, 35 mile greenway ride. TORC would like to thank Selene for spending some time with us and we thoroughly enjoyed showing her some of our busiest urban trails. We hope to see her again in the future. Thank you Selene from all of us at Triangle Off-Road Cyclists. TORC is excited to announce that we have contracted with Native Trails and Elevated Trail Design to fulfill the RTP grant project at LCCP. Using feedback from a poll given earlier and a desire to offer some ‘fun factor’ within the second half of the LCCP trail network, TORC has specifically arranged the grant to use portions of the money towards ‘fun factor’. 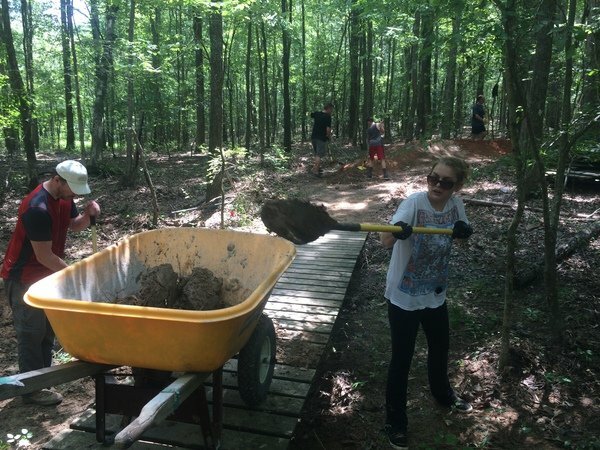 Another portion of the grant will be used to extend the dirt jumps farther and to circuit back around towards the beginning of the jump line. As well as working on some of the drainage issues, this will also allow the dirt jumpers to circle back around to top versus walking back up the sides of the jump line. With this RTP grant contract, along with the current and future work that the trail coordinator and Drew are working on, we hope that LCCP will continue to be the great trail system that it is.